I got up at noon, laid in bed for a bit, then showered. I was sitting on the bed, resting after my exhaustive shower, lol. My Dad came through the room. I am still in a hospital bed in his TV room, next to the bathroom on the second floor. I am not strong enough to consistently make it to the very nice bedroom they have for me on the third floor. I ask him how my sister-in-law is. She is in MGH for a non-life-threatening, but painful reason. And to rub salt in the would, she and my brother Frank were supposed to leave on a cruise tomorrow. Poor Diane & Frank! Anyway, my Dad starts to outline the day. Now I know that in addition to whatever he is about to tell me, he got up at 5 am, showered, cleaned something and had breakfast with my mother. But he also.... walked to the supermarket - 1 mile round trip - to get milk, eggs and bread. Then my brother Frankie called, his car registration was expiring today. He hasn't left Diane since Sunday. So my father walked to MGH - 1.9 miles - to get Frankie's registration. Then down to the registry in Chinatown - anther mile. Then back to MGH to drop stuff off and check on them. Then he walked home. He had lunch and showered again. Let's talk about something besides me..... Please go to BlackFive and read "108 Hours". Then please help out in any way you can. And pass it along. Geraldine Ferraro has just passed away from complications of her multiple myeloma. It's ridiculous to be upset. She's had it for more than ten years. She was 75. But still, whenever I hear of someone passing from this.....and it happens on my email group.....I get bummed. I mean, it is incurable. I'm on and on about this friggin' transplant, but all it's only pushed me into remission, not cured me. So I am going to switch to the Comedy Central channel and eat this strawberry poptart. 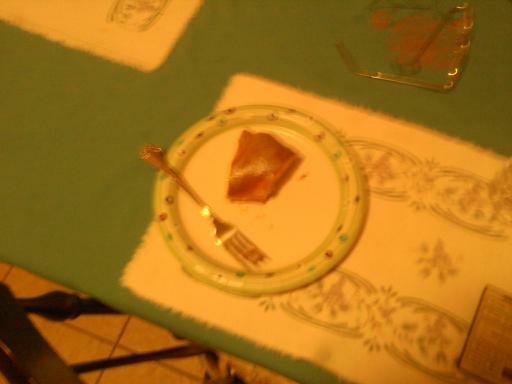 I wanted the last of the blueberry pie, but my Dad beat me to that. I have to call Grace tomorrow and sing happy birthday. We had her party today - and it was fun - but tomorrow is her actual birthday. So, some fun on another dismal, bed-ridden day here. I have a sore throat and a headache. But I am on anti-virals and have anti-biotics handy, so Kate my NP says I don't have to make a special trip in. After all, the regular weekly visit is tomorrow. Today is Day #41 post bone marrow transplant, so everyone is pretty calm about it. But how to fill my time? Well I did fantasize about the salad I am going to have on Day #50, but that didn't take up much time. What next? This is just what I needed. "64 fighters enter, only one leaves"
"key factors that make someone successful on Twitter: knowledge base, logic and reasoning; humor and snark; facility with quips; frequency of tweets; willingness to engage with followers; charisma; and overall awesomeness." I have also endorsed @Galrahn of Information Dissemination a leading member of the Naval blogosphere He is also the one who christening me as the Goddess of the Naval Blogging Strike Force (& we've been out drinking together). @MattGallagher83 of who I almost missed until Sherri pointed him out. He writes Kerplunk. Then I got solicited for my endorsement by @DaveedGD of the Foundation for Defense of Democracies. I read his web page and tweets and found him worthy of a follow and an endorsement. After four days of being up and about, I crashed before the last guests left Sunday, lol! I have been in bed ever since. The birthday was good. My sons, their girlfriends, my parents, sisters, brother, and assorted nieces and nephews made a great chorus. The chocolate dessert was a big hit. I got presents......except for being exhausted it was perfect. So I've decided instead of making or buying a cake for my birthday, I would make a dessert. I picked this with coconut whipped cream. It needs a few things that aren't in the house.....very few, this is an extrordinarily well stocked house. Grace and I had been discussing going to the store, but I slept all afternoon. So she called my phone and I just missed it. Twenty seconds later she called the house phone and blabbed the whole plan. You know, this is not a place you do things last minute or by the seat of your pants. What did I want? Why was I doing this? I called Grace and said "Good job, blabbity-blabber." She's whining that she didn't know it was a secret. Duh! She know what chaos comes with last minute plans. My father was following me down the cellar stairs directing me. "Go back to the Bruins game, I know where stuff is!" There were just three things I needed and by coincidence my friend Kathy is in the supermarket. So after she ragged me for a minute about how she doesn't have anything better to do than take care of me.....she agreed to pick up my things and drop them here shortly. Finally my father says that I can have the left over cake that's on the fridge from Thursday. I burst out that tomorrow I would turn 50! He said he knew that, but hardly anyone was coming over - my sister has one sick kid and so does my brother and someone else is working..... His reasoning was there weren't many people to eat cake. Plus he is not a cake person. Yeah.........."Look just cause I am dealing with a reduced party doesn't mean I should have a reduced cake." He offered me a reduced lip....when I pointed out he meant a fat lip, I was ejected from the parlour. I made it to Stations last night thanks to Kathy and Sean. Sean even thought ahead to back into the driveway that connects to the side of the church so I only had to walk a short distance. I don't know how many people even realize it connects and besides, it's a private way. Anyhow, it bypassed the stairs. I made it through the first three Stations, stand, genuflect, kneel, stand, repeat. I had to sit for the next twelve. But I did manage to kneel for the Benediction and stand for the conclusion. Now we have a benchmark......hopefully next week I make it through a few more. Kathy delivered me all the way into the parlour. She knows she doesn't want any trouble with Muriel! My mother halfway made my peanutbutter and jelly sandwich. I got off the couch for some of it. I used all the peanutbutter and my mother called to my Dad to get another jar while he was in the back hall. He brings out a jar of peanuts and tells her it's going to take a while. He really does crack himself up. When the favorite Naval Consort called he wanted to know why that was my dinner.....didn't I realize I was exempt? Didn't I realize I could have gone to Burger King???? Please...........exemptions are for cheaters. I might not be able to get through all the Stations, but I can get through Friday without meat. Did I tell you Dr. Miller said I could have salad in two weeks? I guess I'll have to let you know. Jen & Grace went with me for my weekly Dr. Miller appointment. I was a little agitated. On Monday my mother had told me that considering my low white blood cell count last Thursday (it had dropped to 1,700), unless I was in better shape, she wouldn't let me have a party. Sunday I am turning 50. Long time readers of the blog will know that I am ridiculously childish about my birthday. I don't share it like some others. My mother celebrates with Genevieve because they are two days apart. Grace celebrates with my nephew Frankie, they are two days apart. Jen and Tom are 8 days apart. There are other examples. My birthday is a stand alone event. When I turned 40 there were 3 separate parties. When I was 46 I had a party with three cakes from Cold Stone Creamery. That's how I feel about my birthday. My sisters know this and I know that they had plans for me turning 50. It's not like I don't understand my present situation. I have adjusted my expectations. I knew there would be no giant party. But I need at least the standard year family birthday party. My father was teasing my yesterday, asking if I felt better than last week. I said that I didn't think so. I was feeling bad for myself and whining about Mum cancelling my birthday. I can't get my father to sympathize. He says "And we'll take away the computer too." But my birthday is saved. Kate my nurse practitioner was very happy for me. I was very happy for me too. I am back up to 2,400 - not as high as the 2,800 from two weeks ago, but this was without neupogen. So I was making my own. Some of my blood work was actually in the normal range and next week we will get and IgA number to measure the success of the transplant. What a great way to celebrate the High Holy Day. Good news and ........ When we got back to my parents house, my father had a fabulous boiled dinner waiting for us. We were a little late, my father was at the gate, pretending to be mad. He yelled for us to run..........if he was on fire I couldn't have run! LOL! He had brisket and nasty, smelly cabbage and icky turnip, but there was also green beans and potatoes and carrots and bread and Irish soda bread that Grace made. My Dad was all excited that the brand of brisket was "O'Donnnell's" because that was his mother's maiden name. "Your mother and I have decided that if you can't eat 3 meals a day, you can't go to D.C. in April"
Spent the day in bed with gastric woes. Finally sent Kathy a text to say that I was not going to make Stations. I finally made it upright about a half hour ago. I heated the dinner my parents brought me back from their outing to the Warren Tavern with my Aunt Ann and my Uncle Frank. I made it about half/three quarters of the way through delicious baked haddock, potatoes and salad when I remembered that a) take out/restaurant food and b) salad are forbidden on a neutropenic diet. 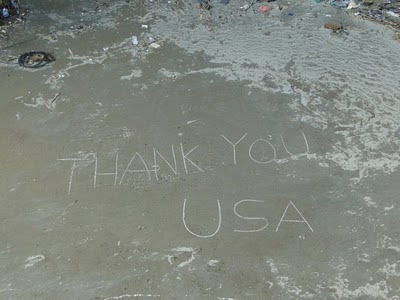 Which might not be the end of the world if I were progressing nicely, but yesterday was another setback. Last Saturday, my white blood cell count was 2,800 (normal is 4,500 to 11,000). Yesterday I had dropped to 1,700. If I don't make more of my own by next Thursday they will reintroduce neupogen. As the Favorite Naval Consort said "I know this is a kick in the teeth. But you have to keep fighting." Yeah, yeah. What other choice do I have? Plus my mother is mad at me about going to Mass Wednesday and trying to go to Stations tonight. She says I am not taking this seriously enough. I made it. Don't tell my parents, but it almost knocked me on my behind. During the Gospel, I could feel my legs trembling. Don't tell my parents. Seriously, if they find out, I won't be allowed to go to Stations. My friend Maryellen just wrote to me about Ash Wednesday and how we're not supposed to be happy during Lent, but I always am, I love everything about it. I love Stations. In discussing what to give up for Lent, Pia suggested I give up cancer, lol. The nuns taught us that it was also acceptable to take on something for Lent as opposed to giving something up. The point is the effort. So I will focus on making Stations each week......cause believe you me........it's gonna be an effort! Tonight was a lot different than other Ash Wednesdays. One year I went to a Jewish Temple to see Geert Wilders and Fitna. Another year I met up with Bouhammer and he teased me about my dirty forehead. There has been a lot of sleeping going on, so I haven't written about two very lovely gestures by two of the Milblog world's greatest ladies. First there were these beautiful flowers from Andi & Mr. Andi....all the way from Florida. Andi is so thoughtful that she took time out of ramping up for the 2011 Milblog and her SpouseBuzz events to do something nice for me. Plus Mr. Andi is my favorite wayyyyyy down south Red Sox fan. He's a displaced New Englander and a really great guy. 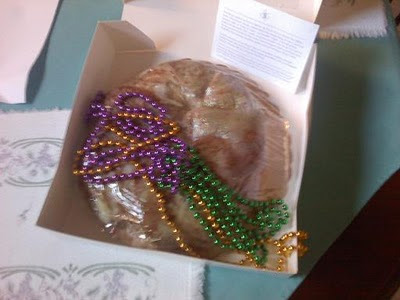 Then today, Fat/Shrove Tuesday there was a delivery of a Mardi Gras tradition from Greta of "Kiss My Gumbo". Here it is - King Cake complete with Mardi Gras beads. I put the beads on and heated the cake per Greta's instructions. A piece for me, a piece for my Dad. Mum said no.....until she watched us gobbling it down, then she stole some of mine. I couldn't wait, I had to have the firsts bite before I took a pic. It was delicious! Rumor has it that the next CNO - Chief of Naval Operation for the United State Navy will be named in the next few weeks. So let's have at it. Last time, I picked the winner, ADM Roughhead, with a little help from The Ogre. This time, being a little more experienced, I am going to make my own pick before asking him or anyone else. This matter has not been discussed with The Favorite Naval Consort as yet since we have been overwhelmed with my state. So whoever he picks......I am on record first. You are all witness and subject to being deposed when he attempts to cheat. I want Admiral John C. Harvey, Jr., Commander, U.S. Fleet Forces Command. ADM Harvey picks up Byron from Sal's front porch. Warrant Diver, also from the porch and various other perches, throws his weight behind ADM Harvey after conceding his own ineligibility. I'll put up info on the others and take info on dark horses and dream candidates. Who also throws a nod to GEN Cartwright, USMC for Chairman Joint Chiefs of Staff. So we'll take your vote on that as well. We're racking up some votes for Stavridis, both claimed and anonymous on Facebook. As of Sunday morning, Adm Stavridis picks up Herb, Josh & one anonymous from Facebook, as CDR Junge. Tim of AW1 Tim's blog votes for ADM Stavridis as does Seth from Facebook and Wendy of My Military Life. ADM Olsen gets a nod from NavyCS who says "I think SECDEF is prepared to move outside the expected. " ADM Greenert picks up his 1st vote from Galrahn of Information Dissemination with the caveat "Greenert will be CNO, Cartwright will be CJCS. I hope either Stavridis or Harvey is CNO, but the Navy these days is too parochial for that." but I can't tell if that's an actual vote. I've met ADM Locklear and found him to be charming, so I would be ok with this. 3) his not being eligible to be CNO. so he is throwing his support behind ADM Harvey and explaining that Olson is a No/Go in the comments of this post. The first few days home I was sleeping 20 out of 24 hours. But that's getting better. The stairs were killing me, but it was good. You know the best way to get energy is to expend it. Today I made a total of four trips up and down. Annnnnndddd.....I didn't need to flop on the bed afterwards like a fish out of water. This is a plus. I haven't been blogging, but I have been reading. Especially all the discussions about a "No Fly Zone" over Libya. "No-fly Zone in Libya? Not without the USN CVN you won’t." Grace and I were discussing it today while I was getting still more platelets. The nurse came in and scolded Grace that my blood pressure would skyrocket. Grace explained "No, it's kinda her thing." And sure enough it was just was low as the previous reading. They released me yesterday afternoon. Jen and Grace loaded me up and brought me back to Charlestown. My father met me at the gate and took my arm. I was perplexed, it wasn't icy. But just walking into the house, climbing the curb, the two steps from the street to the yard and the three steps into the house.........exhausting! I was in bed by 7pm. Except for a few phone calls around 9pm, and trips to the bathroom, I slept until 9:30 am. I'm gonna shower now. I am so happy and grateful to be back here.